CPO continues its musical archaeology with the excavation of another forgotten composer, the German Emilie Mayer. Until the last decade or so, one would have struggled to name a female composer from the nineteenth century, other than Clara Schumann and Fanny Hensel. It might be argued that regardless of their own qualities, their names remained in the public domain principally because of their famous husband and brother, respectively. Thanks to enterprising labels such as CPO and MDG, we know now of Cecile Chaminade, Luise Le Beau, Louise Farrenc and others. Emilie Mayer was born in northern Germany, and studied piano as undoubtedly the majority of middle-class girls of that time did. However, she also wrote music during this period, and perhaps most significantly for her later career, she did not marry before becoming independently wealthy on the death of her father. This allowed her to travel and study, most importantly with Carl Loewe. In 1850, she staged a concert of her own music in Berlin, and continued to do this for the next decade with critical acclaim, and even the attendance of the King. When her musical papers were sold after her death to the Prussian State Library, the compositions numbered almost a hundred, including eight symphonies and many chamber works. One of her many string quartets has been recorded, again by CPO, almost two decades ago (review). There are also recordings of some of her violin and cello sonatas and one of her symphonies, though on fairly obscure labels. The trios owe their style more to the first part of the nineteenth century, rather than when they were written. That said, they don’t strike me as outmoded, just not overladen with Romantic angst. If I was to cite Beethoven, Schubert and Mendelssohn as style guides, that shouldn’t hide the fact that Mayer definitely has her own voice. She also has the gift of melody, which raises her above the throng of many forgotten composers. The D major is the lighter of the two in mood, and overflows with delightful melodies. The darker B minor owes its impact more to its driving rhythms. Both feature quite beautiful slow movements, redolent with Schubertian sadness. While each exceeds 25 minutes, at no time do I sense that inspiration has given way to note-spinning. The booklet notes mention that scores for eight trios exist. That being the case, it seems odd that a third wasn’t included here; it would seem unlikely that they all exceed 35 minutes. Nevertheless, the Notturno, thought to be her final work, is very enjoyable. 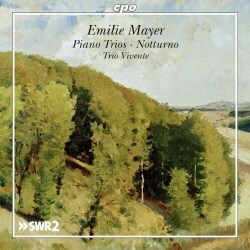 Trio Vivente prove ideal advocates for Mayer’s music. I am particularly impressed by the pianist, whose elegance and lightness of touch reminds me of Susan Tomes of Domus and the Florestan Trio. If I have an adverse comment about the performances, it is the somewhat shrill tone of the violin. The two string players were for many years members of the renowned Freiburg Baroque Orchestra; here they play on modern instruments. The booklet notes are, for this label, relatively brief (a little under 4 pages), but do the job of supplying the listener with background information on this little-known composer, and some on the works themselves. They do, however, contradict themselves in relation to these trios. In the biographical information, it is mentioned that three trios, including this pair, were published in 1861, but over the page, it says that only two were. Encountering a new and unsung composer is always a lottery: this time, it is a definite winner.